It's the big objective lens-indeed, the 'eye' of the Kowa Prominar Spotting Scope that sets it apart from the competition. For birders, these are the scopes that re-define clarity, because-among their other impressive features-they boast a large 77mm Pure Flourite Crystal Prominar objective lens. Ensuring maximum light gathering, clear visual range and sharp images that traditional glass lenses can not attain in the field. • Utilises Kowa's new innovative inner focus system to decrease image movement when focusing on objects-even single handed. • Multiple interchangeable eyepieces available including 20x-60x, Zoom; 30x, Wide; and 25x. They also provide long eye relief for total versatility in the field. Eyepiece locking mechanism prevents the eyepiece from falling out or getting lost. Converters allow users to utilize eyepieces from other Kowa spotting scope series. • Optional stay-on-scopes cases have been designed specially to protect the TSN-770 Spotting Scope Series. The all-weather cases are ergonomically and functionally designed to guarantee extremely efficient use in the field. 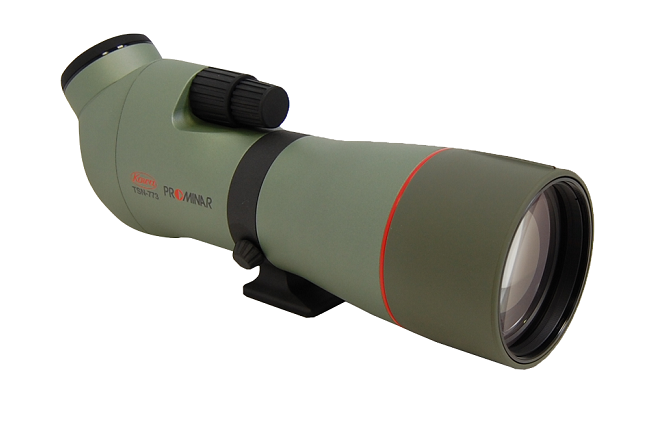 • Kowa offers a total solution for Digiscoping that allows enthusiasts to combine the high optical performance of Kowa's Prominar TSN-770 Series with the quality of various digital, SLR and video cameras in a revolutionary way. Our complete system of adapters offers users the opportunity to observe, photograph and film nature with integrated functionality that was previously unimaginable.